Options to create bookmarks of websites and services have existed in Google Chrome from the very beginning. Chrome users can bookmark any page they visit with a click on the bookmarks icon or the use of the shortcut Ctrl-D, synchronize bookmarks along with other data, and display a bookmarks toolbar for fast access to important bookmarks. 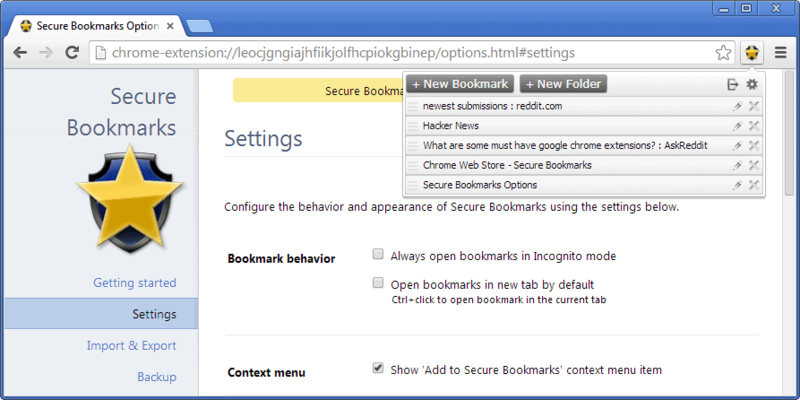 Bookmarks in Chrome are not protected, which means that anyone with local access to the browser or PC can access them. While that may not be an issue most of the time, for instance if different user accounts are used on shared PCs, it may be problematic if the same account is shared, or if others use the browser from time to time. If you have bookmarks that you want to keep private, then you need to use third party extensions to achieve that goal. One option that you have in this regard is to use the Chrome extension Secure Bookmarks. The extension adds secure bookmark storage to Chrome that works independently from the browser's internal bookmarks storage. After you have installed the extension, you need to set a password that protects the bookmarks. When you want to access the protected bookmarks, you are asked for the password the first time during each session you try to do so, and, depending on how the extension is configured, again after set intervals (meaning you can configure that you are automatically logged out so that it is necessary to authenticate again). Bookmarks can be added with a click on the extension icon and the selection of New Bookmark in the menu that opens up. Here you can also launch any bookmark with a click on it. Depending on how you have configured the extension, it may be opened in the active page, or a new tab instead. If you keep the default preference, that is to open bookmarks in the same tab, then you can hold down the Ctrl-key to open them in a new tab instead. What you may also do here is to import your Chrome bookmarks from the bookmarks bar or the regular bookmarks, or transfer them between them instead using drag & drop operations. Another interesting option is the ability to always open bookmarks in Incognito Mode, which has the effect that Chrome won't record their access. Secure Bookmarks can be quite the handy extension, depending on how your computer is used. It may not have much use if you are the only user of it, but if it is shared, or if you sometimes hand over the keys to someone else, then it may have its uses for you. We see everything hacked everyday including 4096 bit encryption and you still believe you can have secure bookmarks? Security and privacy are mere fantasies. Time to wake up peeps. Well, the intention is to improve the privacy in a home environment, not something that can withstand professionals. Please show me an example of where someone has broken a 4096-bit cipher? No one uses RSA 4096-bit for encryption, it’s used for assymetrical hashing in Public Key Encryption techniques where you share the initial keys, such as HTTPS. Symmetric ciphers like AES are used for reversible encryption. If you’re going to make a bold, BS statement, at least get it right. It sometimes is helpful to google for information prior to posting. A side-channel attack isn’t actually breaking the encryption standard. That’s why it’s called a side-channel attack. It attacks the implementation in such a way that you don’t have to actually break the encryption cipher to get at the information. I use Xmarks. Not seen Secure Bookmarks and will have a look at it but Xmarks have not let me down (yet). hi I was using this and a few month later I changed my windows and added this again now all of my bookmarks are gone. can I get them back?